Victoria Way, Charlton, SE7. Photo © David Secombe 1998. 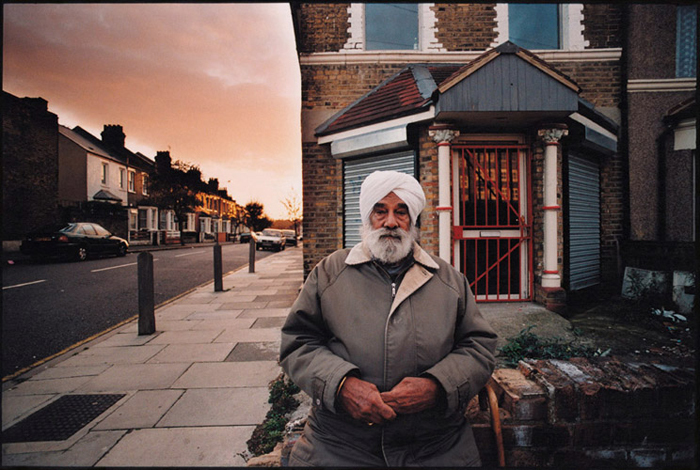 This gentleman lived a few doors away from where he is pictured, sitting at the junction of Victoria Way and Eastcombe Avenue, a daily routine which enshrined him as a local landmark. I photographed him twice, this being the most successful attempt. He indicated that he was deaf, so conversation was impossible, but he posed and co-operated with beguiling charm. He had a sort of stoic nobility and his presence on this nondescript south-east London street lent it a mysterious, romantic quality which it otherwise had no right to possess.